Junior Athletes is an after school programme, created for 8 to 12 year old beginner golfers who want to learn the amazing game of golf. Junior Athletes are educated not only in the skills required to better and enjoy themselves on the golf course, but also learning important physical literacy and co-ordination skills that will benefit them in all life activities, developing Athletes First, Golfers Second. Golf also is an amazing sport for learning important life skills including Hard Work, Drive, Passion, Progression, Organisation, Emotional Control, Etiquette and an infinite amount more, with a huge passion of ours being to develop not only a great athletes, but great people. The Junior Athletes programmes runs every Monday from 4:45pm-6:15pm as is designed entirely around learning through playing. It’s vital for young athletes to enjoy learning and playing sports to ensure they keep up their participation as they get older. 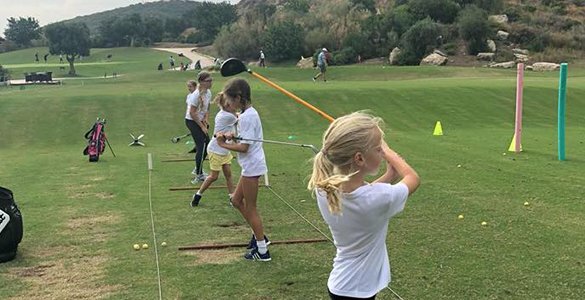 The Junior Athletes programmes are designed largely through game based drills, not only golf drills, but drills in a variety of sporting movements to ensure they are developing the co-ordiantion skills required to proficient in every sport they play. The natural progression for our Junior Athletes is to join the ACES Ladder on the Future ACES Programme which then provides a larger emphasis on specific golfing skills and movements.